I know it’s only the second day of February and that means we still have a good bit of winter left, but the past week has given us little signs of spring. I’ve heard some birds chirping, the weather has warmed up (though it’ll drop back to freezing temperatures next week), the sun is shining, and the snow is melting. As much as I love winter (really, I do! ), the lack of sun and the icy roads here can make it difficult to stay positive, so I’m welcoming these little signs of spring with open arms. Spring is very beautiful here, minus the muddy/icy roads, and I’m looking forward to it! Of course, the nice weather this week means noisy and overly energetic kids at school, but I can’t really blame them. This weekend might even be over 50 degrees (Fahrenheit, of course)! I may have mentioned this, but I’ve really enjoyed this project of taking a photo a day, most days. I reached my original goal of 100 days of photos, and my new goal is to continue the project as much as possible throughout 2018, posting them each week. Here’s Week 1 of 2018 (I took a short break)! 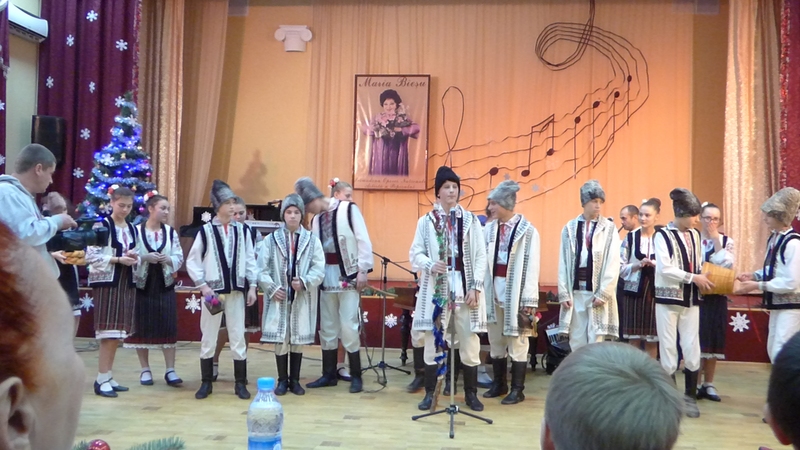 January 13: Some boys at our front door, performing an uratura for the “old” New Year. January 14: Some girls visit our front steps and throw seeds at us while wishing us a happy, healthy, and prosperous new year. 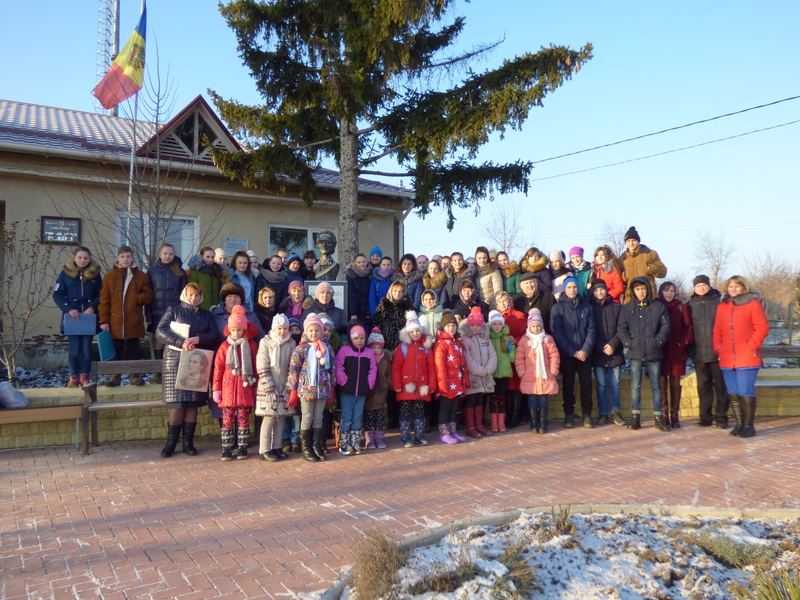 January 15: Students and teachers gather at the bust of Mihai Eminescu, a famous Romanian writer and poet, on the day of his birthday. 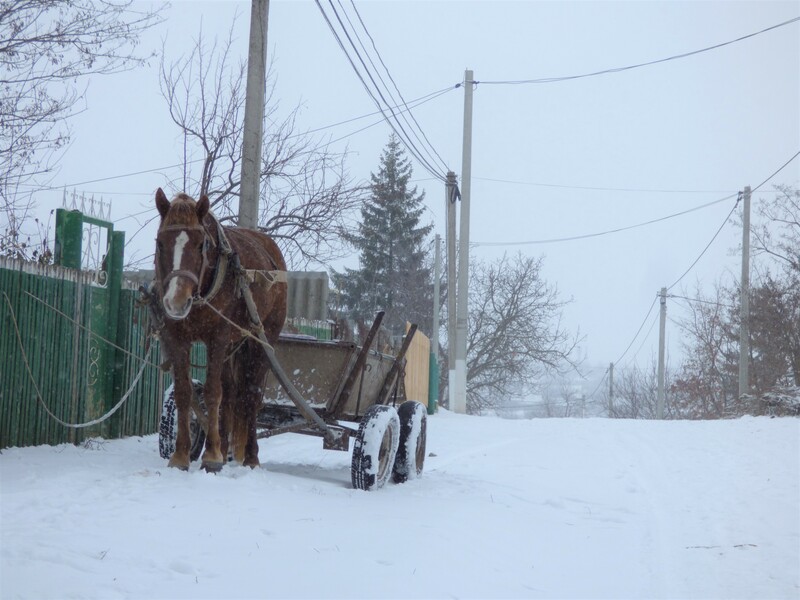 January 16: A horse and cart wait on the road in the snow. 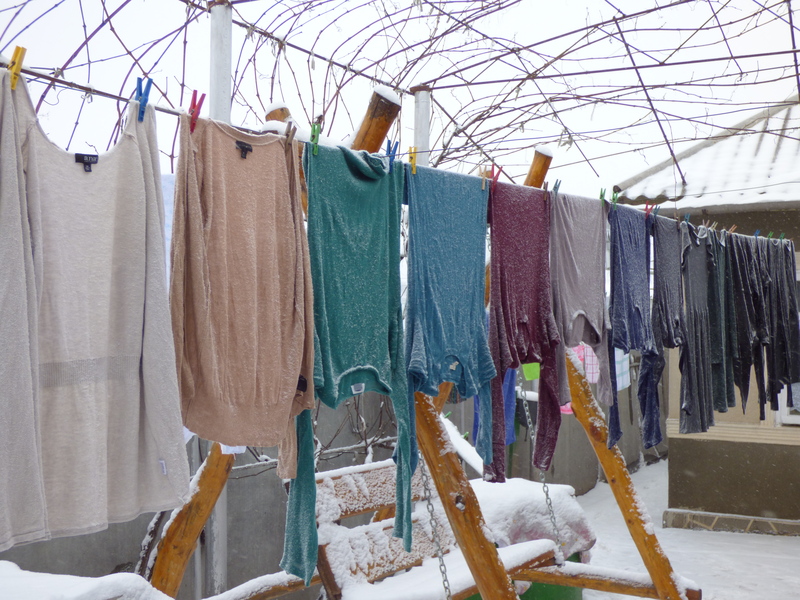 January 17: Clothes “drying” on the line are coated with a layer of snow. 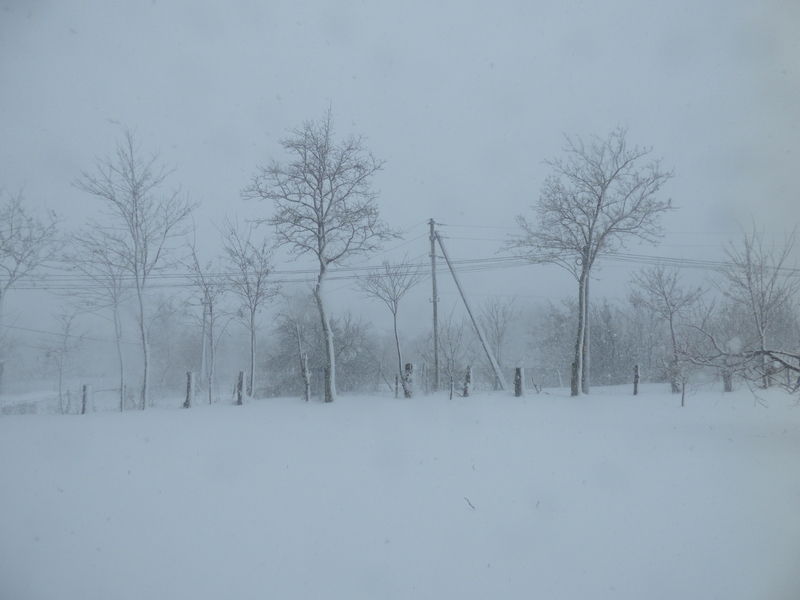 January 18: A blizzard in our village brings down a lot of snow (and power lines) with strong winds. 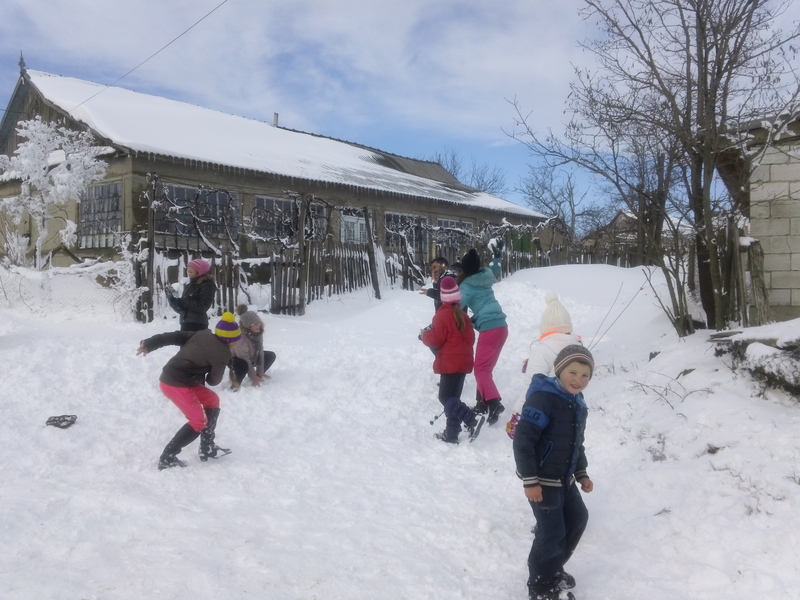 January 19: Neighborhood kids ambush my site mate with snowballs and handfuls of snow. 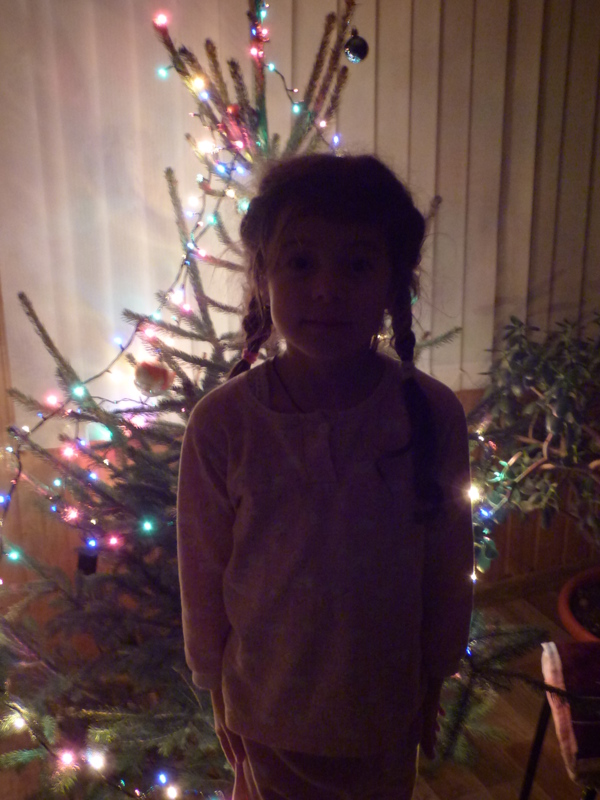 Here in Moldova, many people celebrate the winter holidays (Christmas and New Year) twice! The first celebration happens on December 25th, with Christmas. Then, New Year is celebrated on January 1st. But it’s not over then! Moldovans also celebrate the two holidays based on the “old” calendar, with Christmas falling on January 7th and New Year on January 14th. In my village, no one really celebrates the first Christmas, but in other parts of the country, it is celebrated. We wrapped up the end of the holiday season this past Sunday, and to be honest, I’m a little sad to see it go. 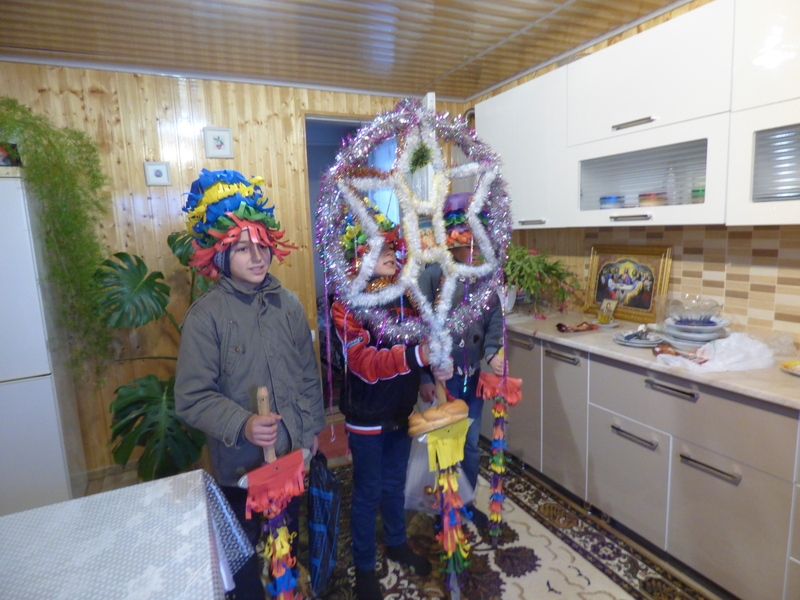 Moldova has some wonderful traditions to celebrate both Christmas and New Year. On Christmas (the 7th), groups of carolers go around and sing at various houses throughout the village. Mostly, the caroling (colinde) is done by women and girls, but sometimes boys and men join them as well. From January 7th until January 14th, groups of boys go from house to house with a star built of wood and decorated with tinsel and bright paper. 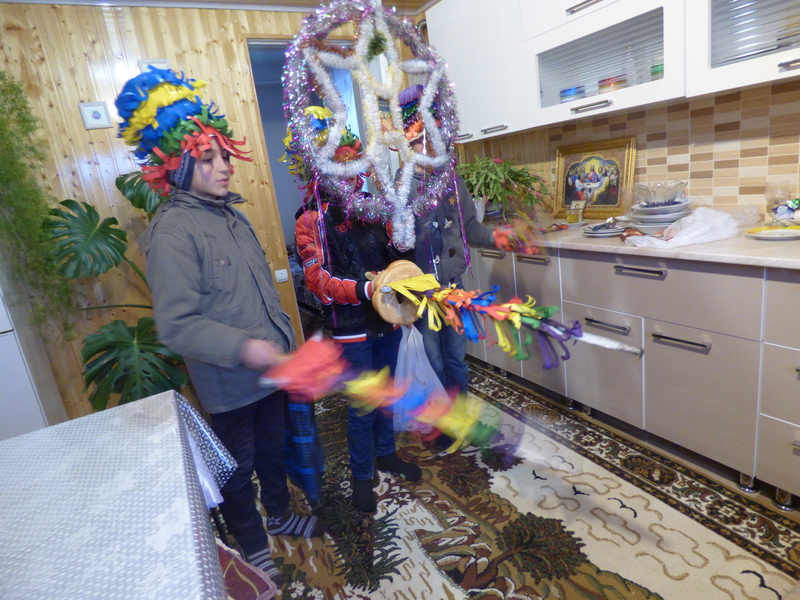 They wear hats they’ve made of bright paper and say prayers and wishes for a happy and healthy new year in front of the religious icons in the house (or, outside the door of the house). This tradition is called steaua (star). For New Year, there are two additional traditions. The day before, on the 13th, groups of boys (and occasionally girls) go from house to house to perform uraturi. These can best be described as poems or chants that contain wishes for a good new year. 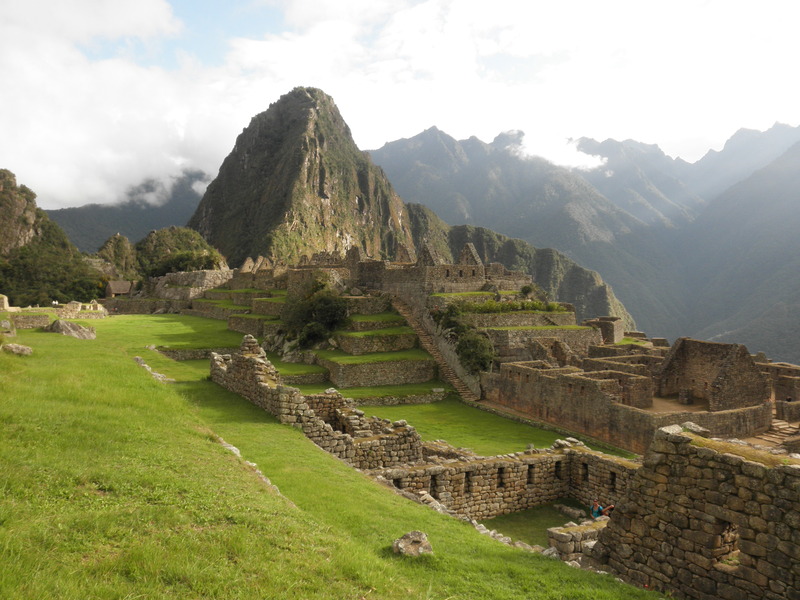 Younger boys will accompany their speaking with a bell, while older boys will often do a whole skit, complete with bells, whips (they whip the ground), and a piece of rope pulled through a metal ridged can. Some 8th and 4th grade students throw seeds at our doorway. On the day of the “old” New Year, groups of children and occasionally adults go from house to house and say poems for good wishes in the new year and throw seeds and grain at the inhabitants of each house as good luck for a fruitful harvest in the autumn. In return for the well wishes, the family that lives in the house gives each child or person candy, money, and cookies. For the steaua and colinde, each group is also given a colac, or braided round bread. The traditions are really quite beautiful and fun, and the students were excited each time they realized I lived in the house (a few knew, but others looked at me in surprise). 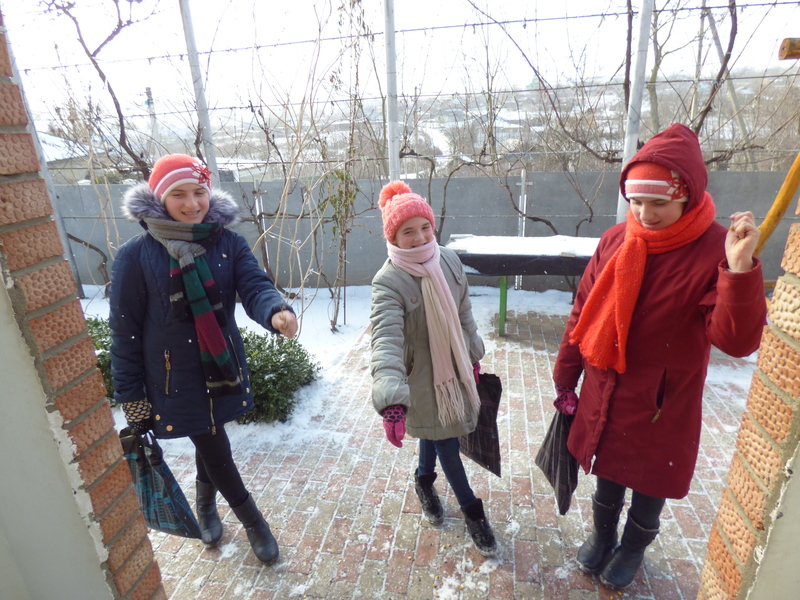 To see some traditional colinde (carols) and uraturi (chants/skits/poems), and the seed-throwing tradition, check out the video above in which a group of students from the music and dance school in our village perform for a national radio station. Almost all of the students (except for two that are playing instruments) are either my current students at school or former students, and they did an exceptional job! The video is long, so here are the times for each part: the colinde are from 2:25 to 9:53, the uratura is from 10:03 to 14:04, the seed throwing and well wishes are from 14:05 to 14:44, and the last part is the hora, Moldova’s traditional dance, performed the way it is done in my village (each village’s hora is a bit different) from 14:44 to 16:07. Enjoy! 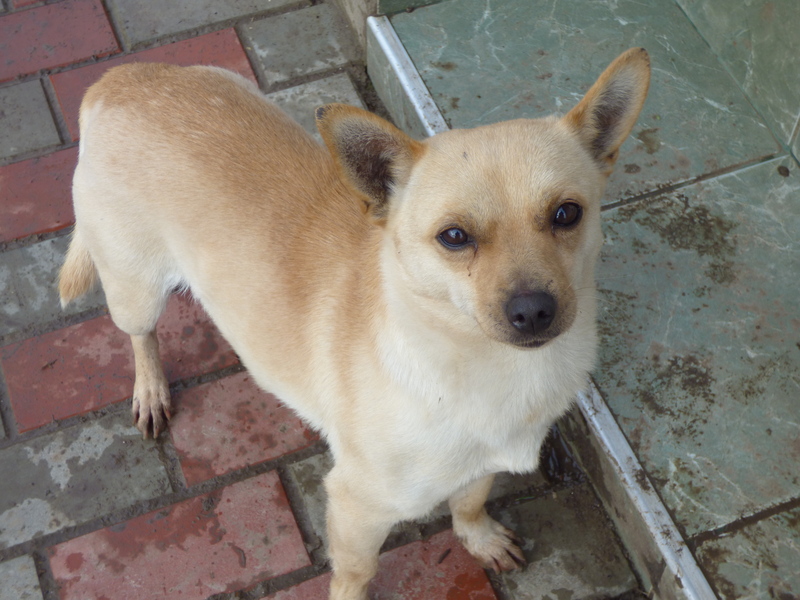 Day 99: Our dog, Rochie, waits by our muddy steps. 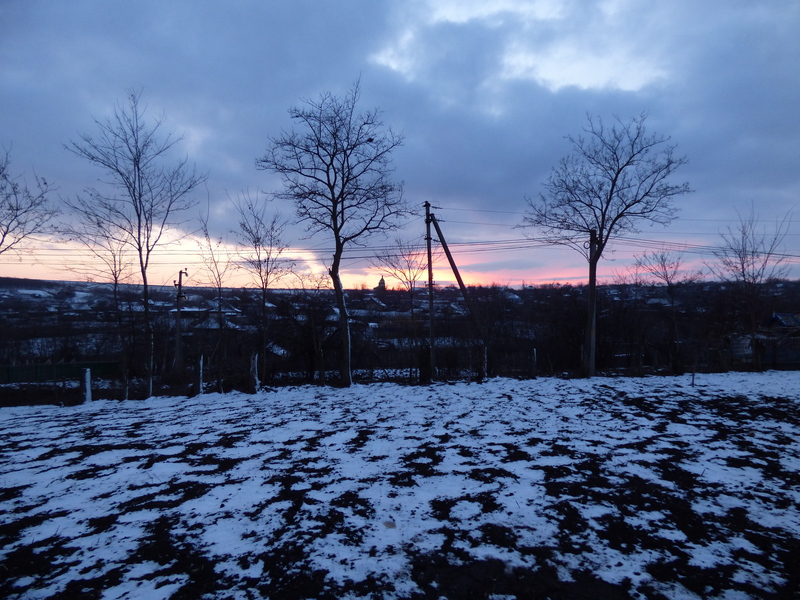 Day 100: A light dusting of snow and a sunset sky. 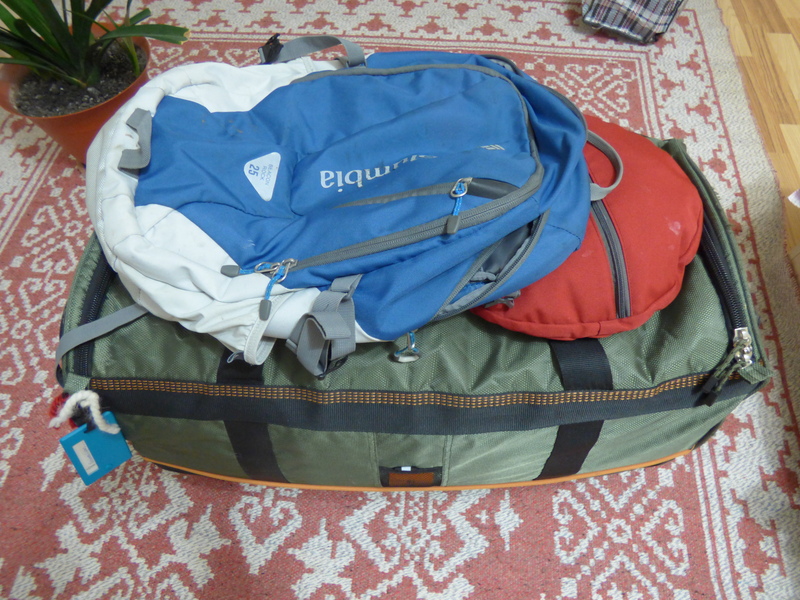 Day 102: Packing for my trip home to the USA for Christmas vacation. 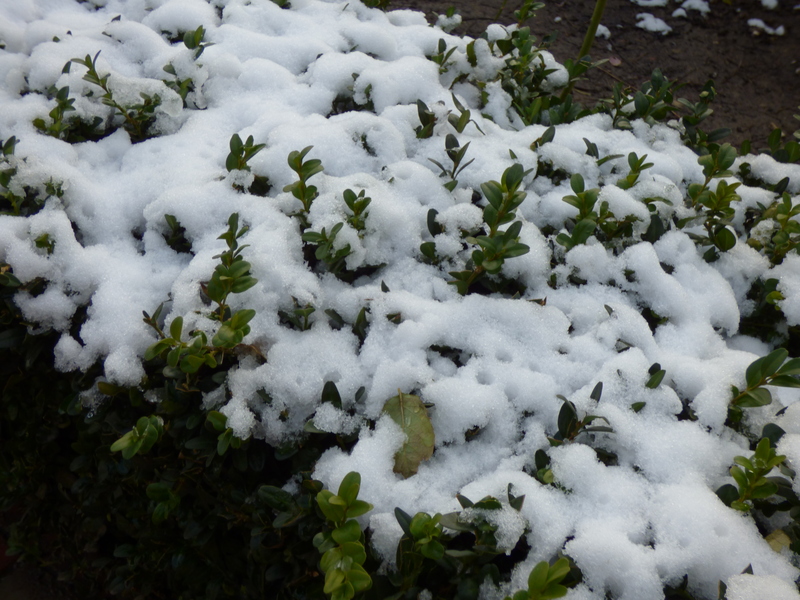 Day 101: The last of the snow remaining in our courtyard. 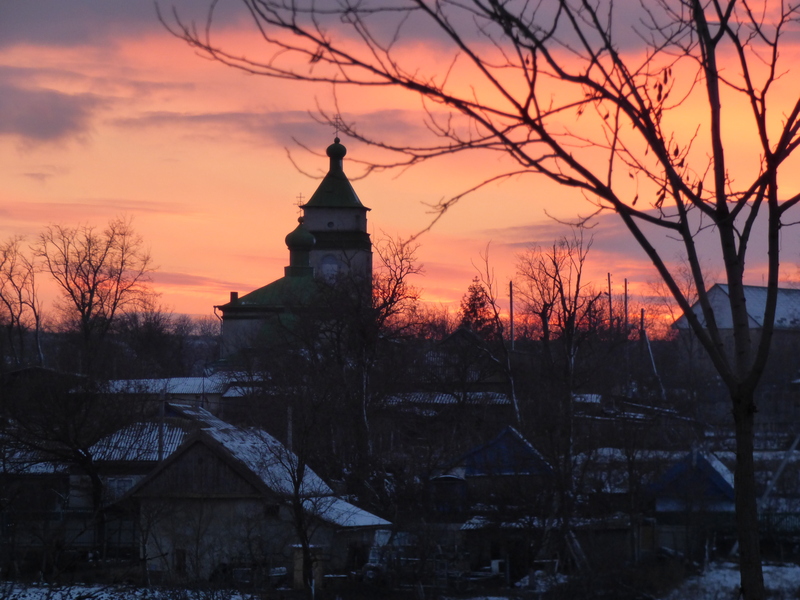 Day 103: A beautiful sunset over the village’s church. Day 104: Some of my students perform at a holiday concert in our raion center. 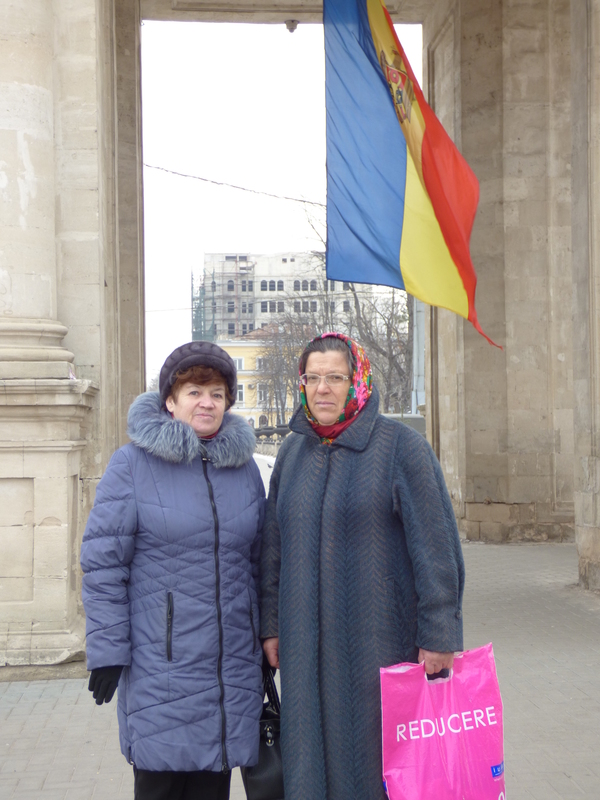 Day 105: My host mom (right) and her friend Natasha in front of the Arcul de Triumf in Chisinau. The weather here has been consistently nice and warm for the past month or more. 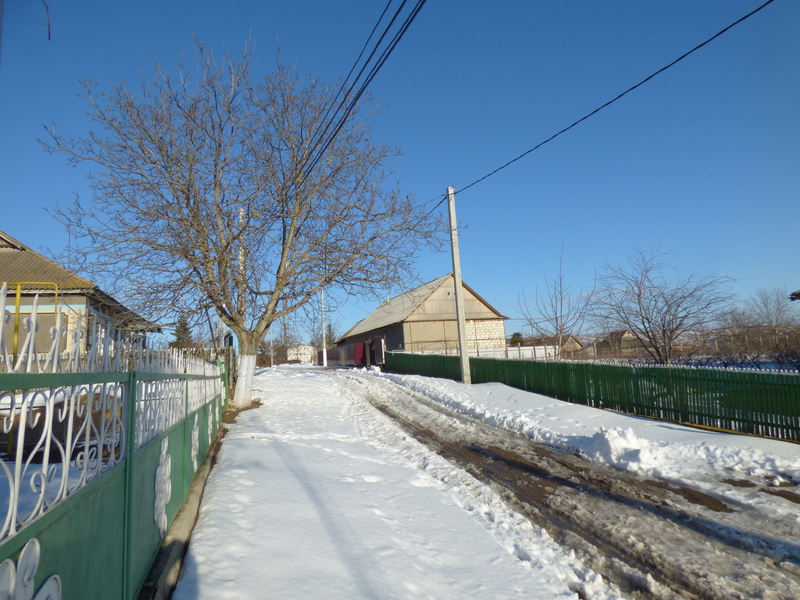 That’s typical for here, and snow in April (even a dusting) is extremely rare in Moldova. On Thursday, however, we got hit with a really big snowstorm with high winds and cold temperatures. 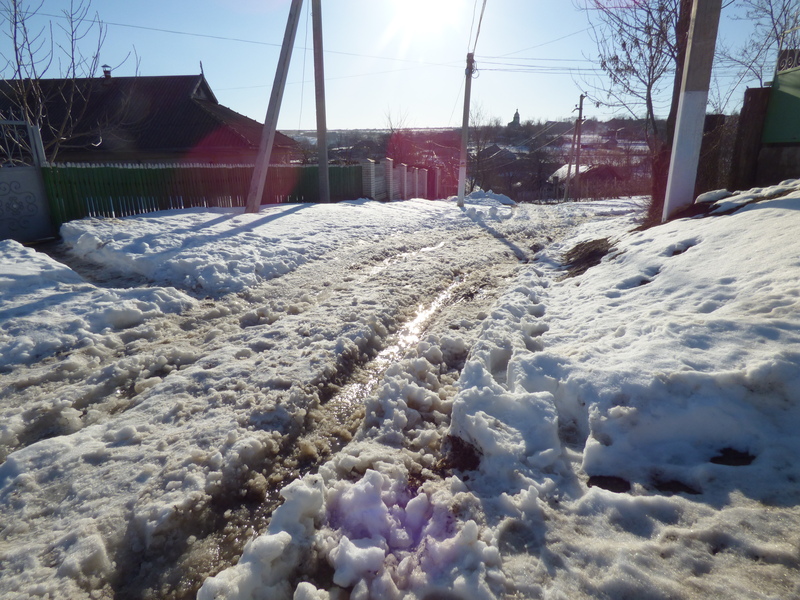 According to the news, this is the most snow Moldova has ever gotten so late in spring. It also caused a lot of damage. In Chisinau and the south of Moldova (where I live), we got about 2 feet of snow, and it came down fast. Power was out for the majority of Moldova for a couple of days and some locations are still without power. Heavy winds caused a lot of trees and branches to fall, and there were over 3 dozen car accidents in the capital alone. The worst of the damage, though, will most likely be to crops. 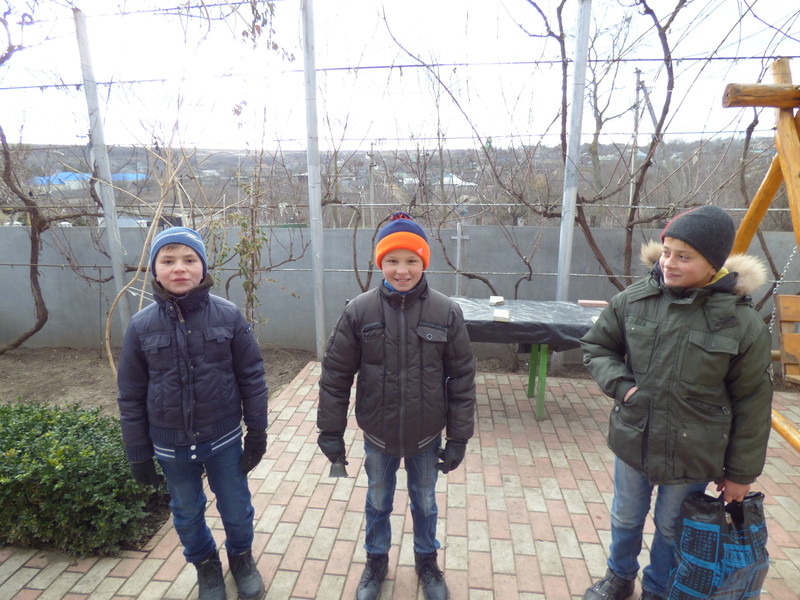 Moldovans start planting around March 8th, so a lot of things have been in the ground for over a month. In addition, fruit trees were in full bloom. There’s still a decent amount of snow on the ground, so it’s impossible to know how much damage there is. My host parents think the onions might be okay, but they (and everyone else) likely lost their potatoes and beans. A lot of people who have greenhouses lost everything because the strong winds destroyed the greenhouses and they couldn’t get everything inside quick enough. My host brother’s wife’s family think they lost about half of the plants in their greenhouse (which means about half of their yearly income). Moldovan officials have said there may be a shortage of fruits and vegetables this summer, leading to possible rationing. My village lost power for over two days. My section of the village regained power around 8pm on Saturday, though some sections are still out. Thankfully, most houses in my village are older and therefore have sobas, or wood stoves, for heat. In areas with more modern homes with radiators, some people have been without heat for several days. We also didn’t lose water, but other villages did. It was a long two days without power. I’ve been on break the past week, and definitely got pretty bored without books to read (living abroad, I don’t have physical books and my Kindle’s battery was dead), people to play board games with (my host parents were busy preparing things for the holiday that is today and shoveling, etc. ), or really anything else to do. On Saturday evening, I played a game of Bananagrams with myself to help pass the time. It looks like this week will be back in the 60s or 70s, so the snow should melt quickly (it’s going to be so muddy! ), and then we’ll see how much damage there is. For now, we are very thankful we have power again!